Natural rubber has good resistance to mild acids and alkalis, salts and chlorine solutions. It has poor resistance to oils and solvents and is not recommended for use with ozone. Its temperature range is very limited and is suitable only for use from -70 F to 200 F.
At Goodrich Gasket, we manufacture Non-metallic flat gaskets from arimid fiber, glass fiber, elastomer, Teflon (PTFE), graphite etc. according to ASME B16.21 which covers types, sizes, materials, dimensions, dimensional tolerances, and markings for non-metallic flat gaskets. With the valuable assistance of skilled team of professionals, we are engaged in trading an extensive range of high quality Non-Metallic Gaskets. 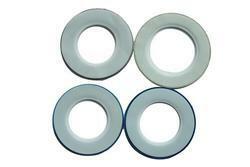 Our organization offers a distinct range of Non Metallic Gaskets that is available in several specifications. These are widely appreciated their excellent durability and unique quality. Our high quality non-metallic gaskets are manufactured using raw material such as CAF sheets, non-asbestos sheet material, non-asbestos millboard, insulation sheets, graphite, thermo plastics, glass fiber and many other materials. These products are available in ranges such as cut gaskets, washers, spacers, heat shields, beater addition sheets, PTFE envelopes, cork/rubber sheets etc. Price varies from Rs 5/- to Rs 500/- per Meter based on the specification of the products. 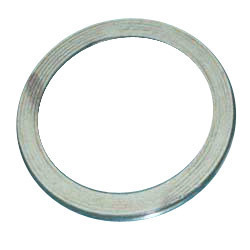 Being a customer focused organization, we are engaged in offering a wide range of Non-Metallic Gaskets. Extensively used in various industries, our products are made using material like natural and synthetic rubber, compressed asbestos, non asbestos fiber cork, woven asbestos, graphite at our manufacturing unit.